I had such fun with this group of readers, who spent perhaps forty-five minutes discussing the book and asking me questions about my experience with co-authoring. The rest of the evening, we indulged in gossip, beverages and snacks. And oh, what delicious snacks. It was a feast that complimented my two glasses of wine–cheese, crackers, grapes, brownies, cookies, nacho chips…I think that reading a book is just an excuse for these friends to get together and party. What is it about alcohol, snacks and books that they go together so well? 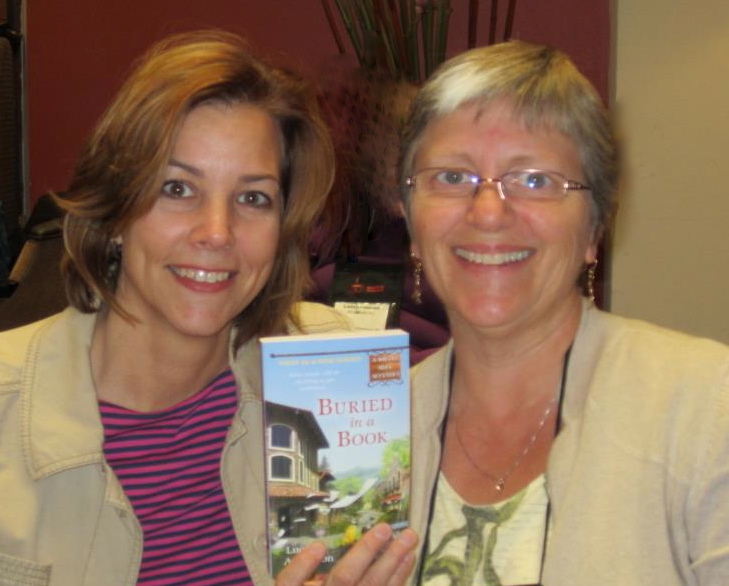 My long-time friend, Paulette, is an avid reader, librarian, and kindred spirit, and belongs to a book club in Wisconsin. Whenever she tells me stories about them, I experience a small bit of envy because I am not a member of that wonderful group. I should mention that Paulette has been one of my most encouraging supporters of my venture into writing. When The Unraveling of Abby Settel was published, she put it forth as a selection for her group to read. Last Thursday was the evening they were to discuss the book. This was not simply a case of nepotism, as Paulette indicated that Abby’s story would appeal to her fellow readers. Some of them had dealt with the impact of relocation, others with aging parents or wayward teens. Of course, the group meets in Wisconsin and I live in Bermuda–not a simple commute. I participated via Skype. 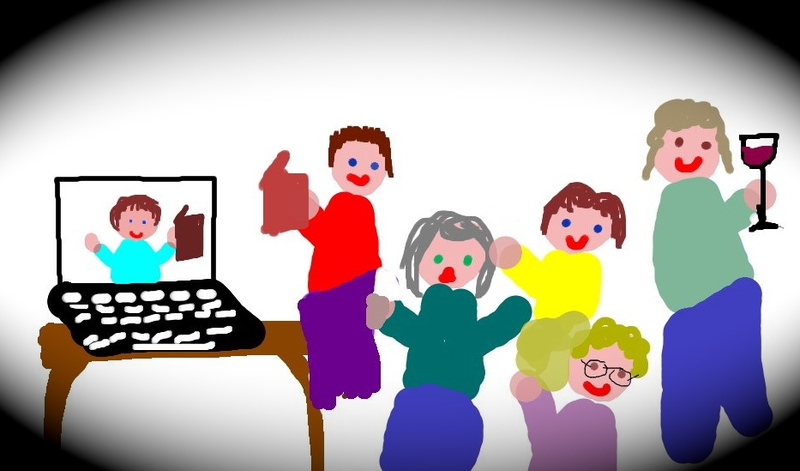 Paulette had set up her computer in her living room where I had a complete view of all her fellow readers and they could talk to me through the screen. It was lovely. Except for the fact that they were drinking wine and I was sitting at my computer with a cup of tea, it was almost as if I was right there with them. I was honoured that they wanted me in for an author’s visit. They asked me thought provoking questions about my experiences, Abby’s story, and my journey as an author. But deep down, I was thrilled to finally, if only for one evening, be a part of Paulette’s marvelous book club. Thank you, ladies for letting me join you! Do you belong to a special book group? Last weekend (boy, this week went fast!! ), I was in Bethesda, MD at the Malice Domestic convention. I went there as Lucy Arlington, promoting our A Novel Idea series. It was a hectic, whirlwind and exhausting three days. But it was lots of fun, too. The convention is a fan convention, so the majority of attendees are readers who love the cozy mystery genre. It was a highlight of my weekend to meet so many fans who enjoyed Lila Wilkins’ adventures in Inspiration Valley. But it was also an opportunity for me to connect in person with my co-author, Jenn (see the photo–that’s us just after I arrived at the hotel). We were friends before we were co-authors, so it was wonderful to be able to hug each other. Sharing a hotel room gave us lots of opportunities to catch up. But it wasn’t only about fun for us. We worked, too, plotting out the next several chapters in the book we’re currently writing. It was great to meet up with other author friends whom I’ve met through the cozy world. Cozy authors are such lovely people. Friday–I arrived in the afternoon, met up with the Cozy Chicks, and then was treated to a wonderful dinner at Ruth Chris by our publisher, Berkley Prime Crime. I sat at a table with our editor, Kate, and all of her other authors. Saturday–First thing in the morning, I hosted a table at the New Authors breakfast, breaking bread with readers who wanted to meet Lucy (and who wanted to get up for 7am!). Later, Jenn and I met with our editor, Kate, to discuss our books, after which I met with our agent, Jessica. In the afternoon I attended a panel that Jenn was moderating. For dinner, a group of us went out for supper. Sunday–I sat on a panel, discussing the topic, “No One is Safe in the Book Industry.” When Jenn and two other Cozy Chicks, Lorraine and Leanne walked in the door, I was thrilled to have their support, as I was a little nervous sitting up there with four other authors and a microphone in front of me. After the panel, I had a signing, where readers could come up to me personally to ask questions and have their books signed. By the time the convention was over and it was time to head home, I was tired! It’s hard work being “on” for three days straight. But it was well worth it.